We are excited to announce that we finally have a location for Curds and Wine at 7194 Clairemont Mesa Boulevard in San Diego, California. We have easy access from I-805, directions are given in the side bar at left. We plan to open in a few weeks, so watch your newsletter for the date, or follow us on Twitter @curdsnwine. Please forward this newsletter on to any of your friends interested in making their own wine and cheese, or they can sign up for the newsletter at CurdsandWine.com. Making cheese at home is a very gratifying and enjoyable experience. In the most basic definition, cheese is the coagulated solid portion of animal milk. Cheese can be made a few different ways. The solid, pressed cheese we traditionally think of (such as cheddar cheese) is coagulated using an enzyme called rennet. But, cheese can also be made using acid to coagulate the milk, and this is a great way to start making your own cheese now. After you make some of these easy fresh cheeses, you'll be ready to visit us at Curds and Wine to pick up other cheesemaking ingredients to make more advanced cheeses. Until then, try this at home! Paneer (also spelled panir) is a fresh cheese used in Indian dishes. It is a great example of the very basic processes involved in curdling milk to create yummy cheese. 1 gallon milk – whole or low fat, though you'll have better results with whole milk, just pasteurized milk from the grocery store is fine! Put the milk into the pot and heat to a slow boil. Keep stirring so it does not scorch on the bottom. When the milk starts to boil and just starts to foam, reduce heat and stir in lemon juice or citric acid. You should see the milk form big white curds that separate from the liquid whey. Stop stirring at this point, turn off the heat and let sit for 10 minutes. Put the cheesecloth in the colander in a sink or large bowl and carefully ladle the curds with the slotted spoon or skimmer into the cheesecloth. If you want to pour the curds into the cheesecloth, pour very slowly and make sure you have a very fine cheesecloth, or all of the curds will pour through. Rinse the curds in the colander with lukewarm water for about 10 seconds, then twist the cloth to squeeze out excess water. Put the colander back into the sink or a catch bowl and place another bowl on top of the curds with about 5 pounds of weight on top (I use free weights, but cans or a bag of rice can also work). Press the cheese for 2 hours at room temperature. Voila! You made cheese. 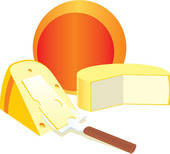 You should get just over one pound of cheese; it will keep for up to 2 weeks in the refrigerator. Heat oil in a large pan over medium heat. Saute onions until lightly browned. Stir in garlic and ginger, and continue cooking for 1 minute more. Turn heat to low, add serrano peppers, and cook for an additional minute. Sprinkle in the chili powder, cumin, coriander, garam masala, and turmeric; cook until fragrant, about 1 minute. Pour in tomato puree and ketchup; thin with water to desired consistency. Stir in the paneer and peas; cook to soften peas, 2 to 3 minutes. Stir in cream, and increase heat to medium-high. Allow the curry to come to a rolling boil, and cook for 3 to 4 minutes. Serve with rice. In our next newsletter we'll describe the basic steps of making wine from a kit. Making your own wine is not only fun and rewarding, but also economical – the average cost of homemade wine from a kit is $7/bottle! We will have demonstrations at the shop for each simple step, as well as winemaking on site, where you just pick out your wine and make it at the shop. We can help you with each step, then clean up afterward and store your wine until it's ready to bottle.